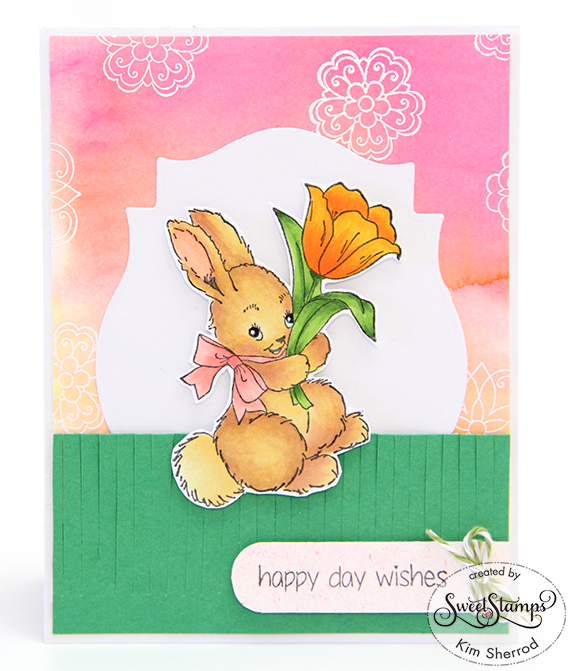 Today I have an adorable card to share with you using Sweet Stamps's Tulip Bunny set. I did some watercoloring for the background and also randomly stamped and embossed the flowers from the Fancy Flowers set using fine detailed white embossing powder. I fussy cut the bunny and used a Spellbinder die to cut out the shape and popped up the bunny using 3D tape. The grass was cut freehand and the sentiment is stamped onto a leftover piece of watercolor paper using the Simple Greetings set. Perfection! Love the color blending. Your workmanship is superb! So glad that you join the fun over Simon Says Stamp Wednesday “A Bit O’ Green” Challenge! A totally delightful Spring creation Kim, many thanks for sharing with us at Allsorts challenge this week. You're right that is an adorable bunny. Great background technique and I love your colours. Thanks for playing along with AAA Cards. Adorable spring colours! Thank you for playing along with us at Allsorts this challenge. Love the happy colors you used in this card. So glad you joined us last week. We would be delighted if you would link with us again at 613 Avenue Create in this week's wonderful Challenge. Have a blessed day!